WCDS will build on the successful launch of its film studio with a second $5,000 grant from CenturyLink. This year, students got their feet wet making documentaries in AP U.S. History and producing an hour-long international news roundtable discussion for AP Comparative Government. Next year, WCDS will expand use of existing film equipment to other classes. 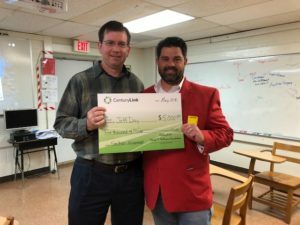 CenturyLink Regional Operations Manager Marcus Hill (right) delivers grant award to WCDS film teacher Jeff Day. Mr. Day will offer a film making class next year, where a small team of students will learn the basics of cinematography, directing, and producing by acting as the director on their own short film and crew for their classmates. “There are many short film competitions out there. We hope to enter a few next spring,” said Mr. Day.